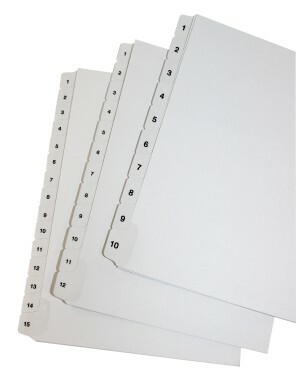 Quality White Card tabbed index divider sets with mylar reinforced numbered tabs. Numbered tabbed dividers are available from stock A5 + tab in 7 different configuations. Box quantities vary depending on size. Supplied collated and unpunched. If prepunching is required please contact us on 01779 470606 or info@ashgrovetrading.com.